That’s the reason George Mallory gave in 1924 when asked why he would risk his life to reach the summit of Mt. Everest—Earth’s highest point and the tallest of 14 mountains in Pakistan, Nepal, and China that are more than 8,000 meters (five miles) high. For dedicated climbers and adventurers, that’s reason enough. 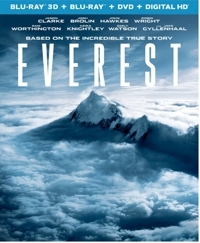 Everest is a 2015 adventure-drama based on a 1996 climb when a blizzard took the lives of eight people, several of which are dramatized here. Reaching the summit takes more than courage and experience. It also takes $65,000 to join one of the commercial outfits leading expeditions each year. Because there’s only a small window of opportunity, based on the weather conditions, the mountain can get crowded. 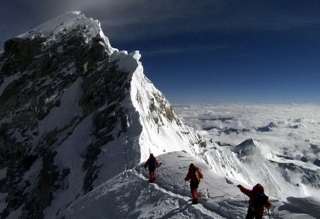 Thirty-four climbers were trying to reach the summit on the same day that year. That’s one of the points made in the movie, which focuses on Rob Hall (Jason Clarke), leader of Adventure Consultants, and his six clients, but also peripherally on Scott Fischer (Jake Gyllenhaal), the Mountain Madness guide that Hall recruits to cooperate with each other. Hall lays it all out for his climbers and viewers at the beginning. This will be a survival challenge. “Human beings are not designed to function at the cruising altitude of a 747. Your bodies will be literally dying.” Like Quint in Jaws, he pulls off his shoe and sock to show them his scars—a foot with no toes on it—and reminds them that one out of four climbers who attempt the summit will die. Those odds don’t seem to bother the climbers, but one wonders about the film crews. 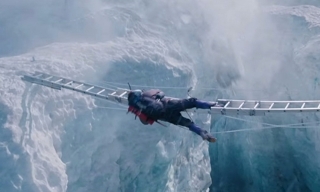 The IMAX documentary Everest (1998) was being filmed at the time of this 1996 climb, and when disaster struck, the crew joined the search and rescue. That’s not highlighted here, though some of the stock footage from that earlier documentary does find its way into the film. Ironically in April 2014, when this fictionalized drama was being shot, filming was postponed because a sudden storm killed 16 people, most of them Sherpas, at a base camp. That’s the true-story backdrop to this harrowing drama, which begins like an adventure and quickly starts to feel like a slow-march-to-disaster movie. Although we spend a lot of time with the characters, we don’t get to know too much about them because the focus is on preparation for the climb and the climb itself. But we know enough to care when some of them die, reach or fall short of their dreams, or barely make it down the mountain. It’s impossible not to be moved, especially by Rob Hall and his Texas client Beck Weathers (Josh Brolin), the latter of whom had “forgotten” to tell his wife and children that he was attempting Everest. This fictional treatment has more power than the documentaries, and on 3D Blu-ray the film looks spectacular—especially those long shots of Everest and the views from the mountain. Depth of field is superb, but don’t look for things to break the viewing plane. The film is nearly as remarkable looking on standard 2D Blu-ray, with solid detail even when snowstorms come. That clarity really brings this experience to life, and the acting and cinematography are as convincing as a script that only briefly flirts with melodrama as we watch wives (Robin Wright as Peach Weathers, Keira Knightley as Jan Hall) come to terms with the situation as it unfolds. If you’ve ever dreamed of doing the impossible—like the Washington mailman who hoped to inspire the schoolchildren of his town who raised the money so he could climb—Everest is a powerful, if unsettling, film. What goes around, comes around. In The Devil Wears Prada (2006), Anne Hathaway played an assistant to an intimidating boss, but in The Intern, a 2015 indie comedy (that’s more fairly called a “dramedy”), SHE’S the intimidating boss. And the poor beleaguered assistant trying to deal with her? None other than veteran screen tough guy Robert De Niro, who plays a 70-year-old widower looking to fill the emptiness in his life and thinking a pilot senior internship program at a new-but-rocking Internet clothing business might be just the ticket. Like Fiona (Rene Russo), a massage therapist who isn’t afraid to go after what she wants, or an apparent second-in-command (Adam DeVine) who’d do the same if he knew what that was. Or Matt (Anders Holm), Hathaway’s character’s husband, who gives up a successful career to let his even more successful wife launch her dream company. 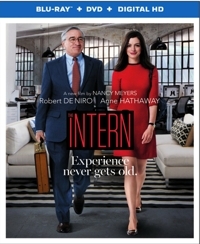 The Intern is rated for “some suggestive content and brief strong language,” but really it’s a pretty upbeat and positive film that mostly keeps any unwholesome moments off-camera. There are three exceptions: the use of the “f-word,” an implication that a man is getting an erection (because someone helps him cover it up), and a woman who drinks too much throwing up in a trash can. But honestly, the whole trajectory of this film is so positive that those few moments (the latter of which can be seen as a cautionary tale) really don’t amount to much. The Intern, however, does. It’s fun watching Ben “get back into the game,” never too forceful but always managing to do and say the right things. He’s as intuitive and resourceful as MacGyver, without all the gadgets. Our family of adults and teens agreed that it was a solid B. Maybe even a B+. It all depends on how much you like Hathaway and De Niro, and we liked them a lot in this engaging comedy with dramatic moments. Takeaway: Two pros can make just about any premise work. Make that three pros, counting Meyers.